The Anglican Central Education Authority’s (ACEA) school system consists of four co-educational institutions. Bishop Michael Eldon School on Grand Bahama island, St. Andrew’s Anglican School in Exuma, and St. Anne’s School and St. John’s College in New Providence. Schools comprise a primary department of grade levels, Pre K – 6 and a secondary department of grade levels 7 – 12. The Chief Development Officer (CDO) provides general oversight of all of the ACEA’s fund development activities, manages the day-to-day operations of the development function. The CDO develops and implements strategies for the cultivation and solicitation of gifts and pledges from individuals, organisations, foundations and other private sources, including grant solicitations and in-kind contributions; assures development and maintenance of appropriate systems to fund development, including but not limited to donor management, research and cultivation, gift processing and recognition; and oversees communications strategies that support and promote development objectives. 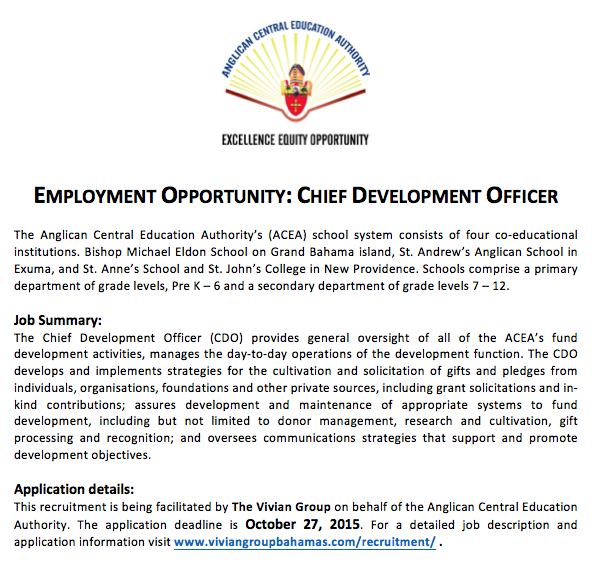 This recruitment is being facilitated by The Vivian Group on behalf of the Anglican Central Education Authority. The application deadline is October 27, 2015. For a detailed job description and application information visit www.viviangroupbahamas.com/recruitment/ .